Despite increased awareness, suicide numbers are rising and the cause is unclear. A key component of prevention is being adequately prepared to screen, but some social workers who do not work directly in suicide prevention believe they are not. Experts suggest how that can change. After declining for more than a decade, the suicide rate rose 24% from 1999 to 2014. Nearly 45,000 people take their own lives each year in the United States, and suicide—a public health issue that costs the country $69 billion each year—is the 10th leading cause of death overall and the second-leading cause of death for those aged 10 to 34. In light of these eye-opening statistics and in the wake of media reports about high-profile figures who took their own lives, such as Robin Williams, Anthony Bourdain, and Kate Spade, the public and health professionals alike have been left wondering what's behind the rise in suicides. According to Jonathan Singer, PhD, LCSW, an associate professor of social work at Loyola University Chicago and secretary of the American Association of Suicidology, there's a confounding juxtaposition. "Despite more educational awareness campaigns and a real effort to decrease the stigma and discrimination around suicide and suicidal thoughts, behaviors, ideation, and attempts, we've seen this rise, and nobody knows why." Looking for the reason may be the wrong question, says Maureen Underwood, LCSW, clinical affiliate faculty at the School of Social Work at Monmouth University in West Long Branch, NJ. "People want data that they can verify. They may say, 'It could be this,' or 'It could be that.' There are a lot of hypotheses out there, but I think the point is that it's dangerous to try to come up with one reason, because what we know is that every suicide is multidetermined. There's never just one reason. We may say it's the economy, for example—that's the reason for middle-aged males. That may be one piece of it, but it's not the whole story." While the whys may not be known, what is known is that suicide is preventable. "The research is clear," says Kesha Marson, MSW, LCSW, an adjunct professor at Augsburg University's masters of social work program in Minneapolis, "that anyone can help save a life from suicide by simply being aware of the risk factors and warning signs and asking the potentially lifesaving question: 'Are you having thoughts of suicide?'" However, a lack of training combined with a belief in various myths about suicide leaves many social workers unable to recognize the signs and hesitant to ask that key question. If you feel unprepared to recognize or intervene with a client at risk for suicide and are uncomfortable asking a client about suicidal thoughts, you're not alone. Social workers who do not work primarily in suicide prevention routinely report feeling inadequately trained. There's a big gap in education about suicide, says Underwood, who notes that many social workers lack basic knowledge. Students and clinicians may receive as little as two hours of training on suicide awareness and prevention, and even many of those who work regularly with potentially suicidal individuals may lack adequate preparation since the majority of masters-level social work programs offer no formal training in suicidology. If you don't work in a practice setting devoted to suicide prevention, you might believe you aren't likely to encounter clients who may be suicidal and, therefore, you don't need expertise in the subject. But the fact is that as a social worker, there's a very good chance that at some point you'll have an opportunity to make a difference for a client contemplating suicide or for members of a family shattered by loss. "Being trained in suicide awareness and prevention is as crucial and important as being trained in CPR," Marson says. She notes that in most practice settings, CPR training is a condition of employment, and urges that training in suicide prevention be considered equally important and even required. A first step in educating yourself to work with at risk individuals may be to correct inaccurate perceptions. Even social workers, experts say, are vulnerable to myths about suicide. "Perhaps the biggest myth is that asking someone about suicide will cause them to have suicidal thoughts," Marson says. "That's absolutely not true, as we know that individuals thinking about suicide were thinking about suicide before the question was even asked," she says. "The reality is having an open dialogue with clients about suicide opens the door for clients to share their personal thoughts and feelings about whether they're actively thinking of suicide. This creates a safe, nonjudgmental place for clients to share in the future as well." As human beings, Marson says, "we tend to avoid things that make us uncomfortable or are unfamiliar to us, so I think there's a level of fear when it comes to asking clients about suicide. There can be this feeling of responsibility and helplessness that comes with not being trained in how to work with individuals at risk for suicide. There's the fear of saying the wrong thing or not knowing what to say or do that may prevent someone from asking about suicide in the first place." But it's imperative for social workers to move out of their comfort zones and ask the hard questions: First, "Have you been thinking about suicide?" And, if the answer is affirmative, "Have you developed a plan for how to end your life?" And finally, "Do you have access to lethal means?" Another misperception, Singer says, is that suicide is not related to firearms. "There's a huge correlation between access to firearms and suicide." In 2016, firearms were used in more than one-half of all suicides. "Research has shown that in states where there are laws in place to restrict access—and that can be by background checks or three-day waiting periods—controlling for all other things, have lower suicide rates and lower suicide rates by firearms than states that do not have those laws," he says. Recognizing that access to lethal means is a leading risk factor for suicide is crucial knowledge. Equally misguided is the belief that depression is always behind suicide. "Some of the symptoms associated with depression are probably associated with almost all suicides," Singer says. Hopelessness, for example, is a symptom of depression. "But being hopeless doesn't mean you're depressed." He points to a Centers for Disease Control and Prevention (CDC) report that came out during the week in which Anthony Bourdain and Kate Spade took their lives that, he says, noted that "half the people who took their lives did not have a diagnosable mental illness, which is different than the story that's been told for decades, that 90% have a psychiatric disorder." Social workers, he adds, may miss opportunities to help if don't feel they need to be concerned about patients who are not depressed. At minimum, social workers must be aware of risk factors and recognize warning signs. Risk factors, according to the CDC, include a history of suicide in the family, prior suicide attempts, child maltreatment, mental disorders, alcohol and other substance use disorders, isolation, physical illness, feelings of hopelessness, and access to lethal means. Standard risk factors, Singer says, include being a white male over the age of 55, divorced, and unemployed, and having access to a firearm. "But you can have a 50-year-old white male sitting in his apartment, unemployed, with a gun, and he has no interest in killing himself. Risk factors are useful, but they're kind of limited in terms of identifying a person who might be in front of you who might be suicidal, so we distinguish warning signs." As an analogy, he says, "risk factors for heart attacks are high cholesterol and a sedentary lifestyle, but the warning signs are tightness in the chest, pain down the arm. When you see those warning signs, then you know it's happening." Warning signs, unlike risk factors, are individual and signal an immediate risk. The first and most obvious warning sign, Singer says, is when people talk about killing themselves. If individuals say, "'I don't feel like this world is for me; I think people would be better off if I weren't around,' that's a statement you should take seriously and follow up on, because it could be a statement that they are actively thinking about killing themselves." Other signs include expressing a significant change in mood or significantly disrupted sleep. More subtle signs, Singer says, include a change in interests—a shift in what they find pleasurable. In addition to being alert to risk factors and warning signs, it's also necessary to be able to help clients build and expand protective factors such as social connectivity, therapeutic alliances, coping and problem-solving skills, and appropriate clinical care for physical and mental health issues and substance use disorders. To learn more about risk factors, protective factors, and warning signs, visit www.sprc.org. It's not enough for social workers to be prepared to recognize warning signs and refer clients to others they think can be more helpful because, as Underwood points out, sometimes they are the resource that receives the referral. And while it's crucial to become educated, it also may be helpful for those starting on their learning journeys to be reminded that they already have skills that can make a difference. "Social workers are in diverse fields, but at the bottom line we're dealing with people," Underwood says. The desperation that leads to suicidal feelings, she says, is something everyone feels at one point or another, and it's important to be able to respond effectively rather than feel it's somebody else's job if you're not adequately trained. "Get trained so you can at least ask the basic questions, diffuse the intensity, and be able to say to someone genuinely, 'Let's see what I can do. I may not be the person that can help you, but we'll work together to find someone who can.'" Social workers, Underwood adds, all learned to rely on joining words: together, we, us, let's. "People who are suicidal feel isolated and alone," she says, believing no one wants or understands them, no one wants to talk to them. "Using these joining words is one of the simple techniques that begins to alleviate some of the stress. It doesn't fix the whole thing, but there's an opening of a door, and if you feel like that's the best you can do, that's okay." All social workers have heard the metaphors about people who are Band-Aids, people who give stitches, and those who are surgeons. "Everybody can be a Band-Aid for suicide," Underwood says. "Everybody. A social worker in any setting can be a Band-Aid and say, 'It sounds like you have some stuff going on. Is there anything that makes you feel that your life isn't worth it? Tell me more, and we'll get you to someone who can put stitches on.'" That might be another community agency that works with people who are struggling with suicide. If that isn't enough, she says, you send them to the "surgeon"—to a hospital—until they feel safe. "It's a kind of triage that social workers are in whether they like it or not." Social workers in all fields have one of those three roles, she says. "It's up to you to know what that role is, and you have a professional responsibility to be able to fill that role." What social workers need most is an understanding that suicide is not usually about wanting to die, but it's rather a solution to a problem they can't solve in any other way, Underwood says. It's a crisis, and social workers are trained to work with crises. Caregivers need to be more open to the hints that people are dropping and talk to them about it, ask them to tell you more. "And you don't need advanced clinical skills to do this," Underwood says. "You just have to be willing to walk with them, to sit with them in their pain, and help them out of the hard place they're in." Singer points out that all licensed social workers have to take continuing education for their license renewal. Because there are no mandated state requirements for suicide education, "they should make a personal commitment to do at least one of their three-hour CEs about some aspect of suicide risk." This, he says, might be mean taking a workshop on assessing for suicide risk or counseling on access to lethal means. If they specialize in grief and loss, they might take a CE on working with people bereaved by the loss of a loved one due to suicide. "They can make this commitment to do this every year because there are social workers who have had clients die by suicide and those who have not yet had such experiences." And while in that way social workers can take responsibility for educating themselves, Underwood says, states need to step up as well by mandating an education requirement about suicide for licensed social workers. Marson recalls that when she was a social work student, she didn't take a specific course devoted to suicide assessment. The subject came up in various coursework but not in a focused approach. "Depending on the state," she says, "the only requirement right now is that social workers have a certain amount of continuing education hours on the topic of ethics. It would be nice to see that mandate include hours around suicide risk and assessment given the rising number of deaths and the number of professionals who do not feel they are equipped with the skills necessary when someone presents as a risk to suicide." "And it has to be every time you renew your license," Underwood says, "because the field is changing and we're learning so much more." Some of what you learn will still be applicable in five years, she adds, but you have to keep on top of it. 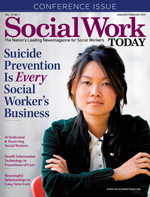 In addition to demonstrating a lack of adequate educational opportunities for social workers on suicide, studies have also shown that there's little social work research in the field to enlarge the evidence base and help guide practitioners on prevention, intervention, and counseling of survivors as well as family members affected by the suicide of loved ones. This is significant because, as Sean Joe, MSW, PhD, has written, the primary source of practice knowledge typically comes from a profession's literature. Finally, Underwood says, all social workers should understand and be able to apply the clinical components of the Zero Suicide model (http://zerosuicide.sprc.org) and the National Action Alliance for Suicide Prevention's framework for implementation of evidence-based practices, which include cognitive behavior therapy and dialectical behavior therapy. They should also stay current about new and existing risk assessments safety plans, such as the Columbia Suicide Severity Rating Scale (http://cssrs.columbia.edu/the-columbia-scale-c-ssrs/about-the-scale), and treatment models, for instance CAMS—the Collaborative Assessment and Management of Suicidality (cams-care.com). Social workers have enormous potential to save lives. Without adequate education and training, missed opportunities may contribute to tragedy. To make a difference, social workers must explore all the ways they can help prevent suicide and improve the lives of survivors. It's an aspirational goal, Underwood says, but an important one. They can learn to recognize the risks and warning signs and become well versed in the evidence-based approaches to suicide prevention. At the same time, they can advocate for increased educational opportunities, take the lead in educating themselves, and contribute to research that may help save lives. Finally, they must attend to self-care and gather support to cope with compassion fatigue and the distress that may arise when working with individuals with suicidal thoughts and behaviors. — Kate Jackson is an editor and freelance writer based in Milford, PA.